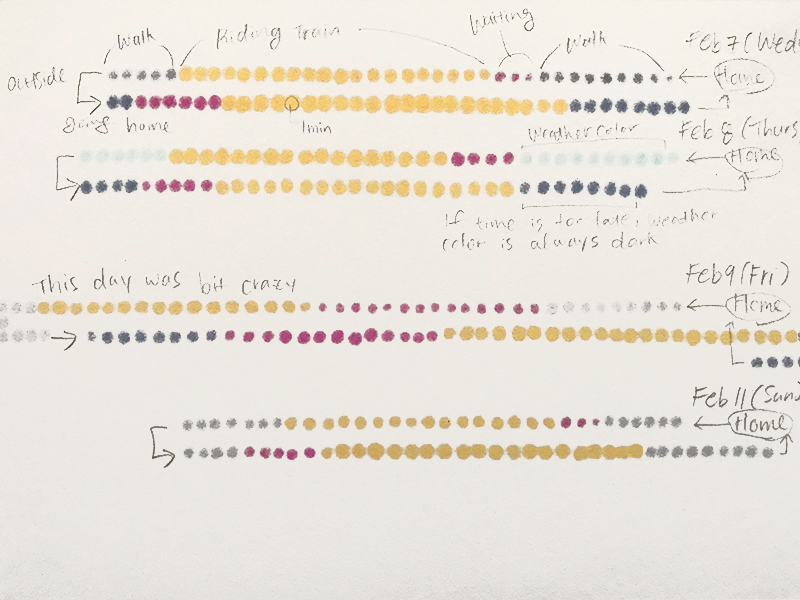 Using "dear data" as a guide, create a set of rules to visualize your data - you may use digital tools, but analog style is encouraged. Think about the ways in which Georgia and Stefanie parameterized the aspects of their records to produce their visualizations. Find ways to express your own personal style and aesthetic in the implementation of your rules. My initial discussion about Dear Data in class was done with Krizia and Miki, and we decided to do a project about a daily commute (an in-class sketch is included on the first image). Unfortunately, we struggled to adjust our schedule for further meeting, so the collective visualization that adds all our data was canceled. Nevertheless, I proceeded my personal one and was surprised that my visualization is very different from Miki's work, despite of the same topic. This is the backside of my project, and as it's mentioned: one dot represents one minute. 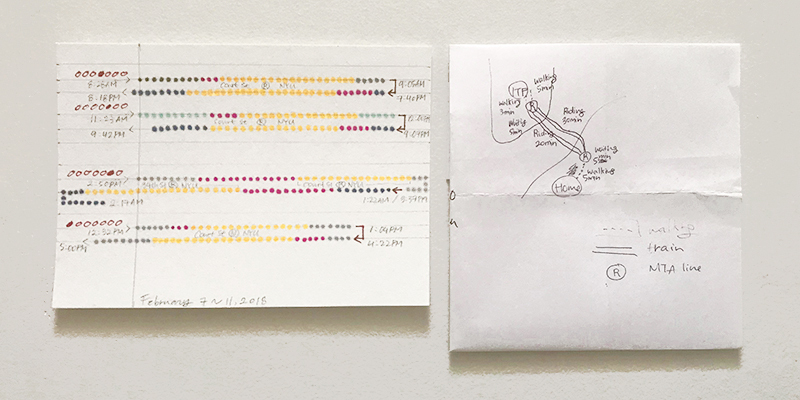 I found out that I have cycle of "walking - waiting train - riding train - walking" every time I commute, so I distinguished each part with different color. Color for "walking" changes upon weather, although if it happens during night~midnight it will be consistently dark navy. When I collected data, I didn't want to carry around several pens and impulsively make mistakes on Joey's awesome paper. To avoid that, I made a little form in flash cards so I can quickly write down times. The data for February 9th is bit extraordinary, because I went home late after drinking for while. Surprisingly, I kept myself to continuously write down data but in extra messy way. Not to mention the different distance changed the overall commute time in much longer way and I ran out of space in the final piece only for the day. On my first reflection, I wrote about what can be "meaningful" data collection - and hearing Aurelia's advise, I decided to keep some passive and random elements in my tracking, because I agreed that having some diversity in raw collection will ultimately give more interesting results after it gets refined. Joey commented about what will be my hypothesis and questions; as much as I started to track IP address due to my curiosity about the relationship between language usage and activity type, I'm adding more questions in Reporter App that has to do with language usage. Many of Reporter App's default questions are about activity, so if it goes well I think I can compare the result with IP tracking. Document your methodology for answering the questions you've set out last week - what are the tools you're using, the frequency of your measurements, helpful how-tos, pain-points and how you've overcome them, etc. Include photos, illustrations, charts, graphics, gifs, or video if necessary to effectively communicate and document your process. Tool: Reporter is an application for measuring certain aspects of one's daily life. The reports have to be done manually. However, once the user inputs an answer it automatically becomes one category that can be chosen next time. Also, if the sensors are activated, the app detects and record extra information. Manual input can be notified either random, semi-random, or regular. Currently I'm using semi-random notification with few customized questions. Tip: I haven't noticed for a week but there's Awake and Asleep toggle button on the right bottom, and according to its status the app won't send you any notification during sleeping time. Also, by turning on location sensor the app will detect if you are awake. Pros: In Reporter App's website, it says "Reporter can illuminate aspects of your life that might be otherwise unmeasurable." As a user who experienced it for two weeks, it does. Through my tracking experience with Reporter, I realized that I have several repeating categories in my daily life. The app's function of transferring my answer into categories definitely helped me to learn these patterns. Cons: Many things are uncertain, because the reports have to be done manually. I've had several times that I didn't hear the notification and missed the report due to various reasons, such as my phone was far away from me. I would like to compare this with a video game: when you have much freedom it's followed by more confusion as well. For that reason, I'm planning to proceed two different types of tracking. Tool: IP Whois & Flags Chrome & Websites Rating is a Google Extension that displays server information about websites, including IP Address and location. First, I was searching for a way to track my language usage without reporting it manually. One of the ways I came up was tracking IP location - although it's not a perfect way because numerous websites use IP location from overseas. Nonetheless, it seemed to be an interesting tracking that is different from the first one. The collection of data will be done daily through Chrome history. Tip: Because I haven't tracked through this extension for a long enough time, I don't have much tips. One thing to mention is that there are several inaccurate IP display extensions, which will make no sense. Pros: Although it wasn't my attention, seeing difference between a website's IP location and the location where the website is being most used was entertaining. Convenient part of using Google extension is: I don't have to input or search information manually every time I switch websites, and the history will be saved so I can gather data easily. Cons: I would still have to document IP information of websites manually every end of the day. It will eventually expose what types of websites I visited. 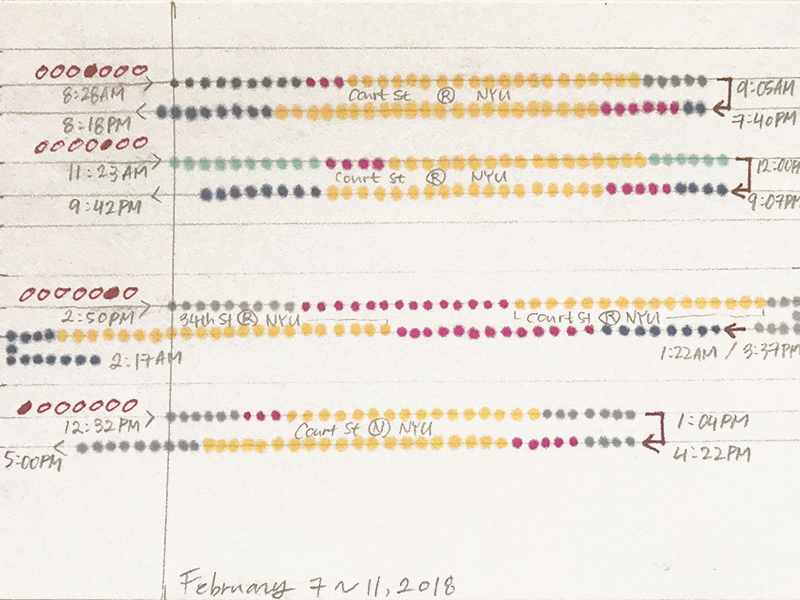 For self-tracking, I didn't know where to start but two things that I knew were: (1) I wanted to try a tool that is only made for tracking (2) I like Nicholas Felton's works. So I bought Reporter App, tried it, and many things about this beautiful app were confusing; such as a default question of "How many cups of coffee I drank today", while I don't enjoy coffee at all. However, soon I realized that the big part of Reporter App is actually refining and developing questions. At the same time, I was stupid enough to just delete the data of first week because I wanted to start over, but that won't happen again. I'm planning to keep this irregular semi-random tracking, along with another more regular tracking about IP address of visited websites. Find 3-5 examples of projects that relate to self-tracking and the quantified self and write a 1. short summary description of the project, 2. the project's broader significance, and 3. why it is interesting to you. When possible, speak to the project implementation as a way to catalog useful methodologies. Feltron Annual Report from 2005 to 2014 contains Nicholas's personal data, such as location data, categories and amounts of physical activity, sleep, weight, continuous hear-rate, blood-alcohol levels, driving habits and computer usage. The project's broader significance comes from the various data categories and merging of them in a format that reveals connections - provides context and suggests correlations. It is interesting to me because his usage of typography and color is consistent and beautiful. Not only that, but also the fact that he repeated this process of making annual report about himself for ten years is impressive as well. Not exactly "self-tracking" project, but more of archive about what refugees carry around. The International Rescue Committee asked a mother, a child, a teenager, a pharmacist, an artist, and a family of 31 to share the contents of their bags and show us what they managed to hold on to from their homes. The project's broader significance comes from presenting more individual life of each refugee than as mere numbers. Observing their bags and possessions allow the audience to see what life they've been living. This project doesn't perfectly fit into the category of self-tracking because it's collected by many people. Also, its format is often used in many organizations, and my favorite is this one. However, I still thought tracking what's in someone's bag tells a lot of information and stories, and has potential to be used as self-tracking. 40 Days of Dating is an experiment by Jessica Walsh to date with her long-time friend Timothy Goodman, since they found themselves single at the same time. They agreed to date each other for 40 days, record their experiences in questionnaires, photographs, videos, texts, and artworks. The project's broader significance comes from their closer observation towards the topic of relationship and love. It's been said that it takes 40 days to change a bad habit, so they went through "the motions of a relationship" for 40 days: the commitment, time, companionship, joys and frustrations. It's interesting to me because it's unlike any other self-tracking that I've seen. 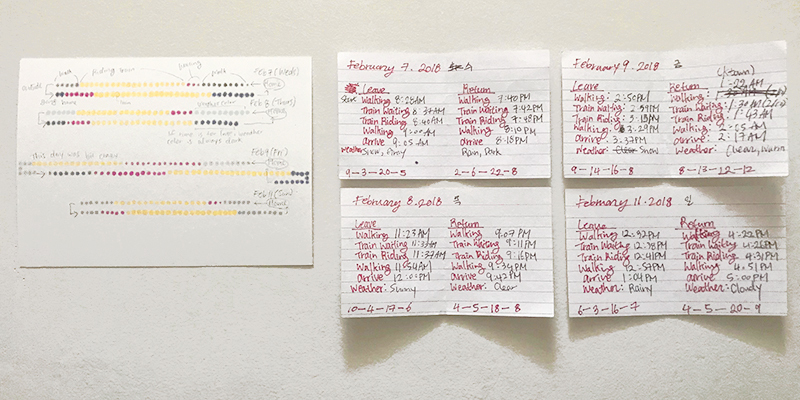 It's unusual in a way that people usually start tracking to confirm their new habit, while Jessica Walsh artificially created a new habit(relationship) in order to record it. Write a short reflection about what your current relationship with self-tracking (e.g. hopes, dreams, perceptions), questions you have about self-tracking and how it could help or harm you, and how you hope the course will help facilitate your interests. Write about which questions you've identified to track, how you plan to track those variables of interest, and what challenges you expect to encounter as well as what you hope to learn. When I hear about self-tracking, it immediately reminds me of a class I took during my undergraduate year, called Relational Design. It was a class focus on collecting massive amount of data from survey, documentation, and archive and transforming it into a meaningful graphic design form. One project that is specifically about self-tracking is the untitled project I took photos of every meal I ate. It was fun as much as it was bothering, and made me realize certain diet patterns I wasn't aware of. However, it wasn't the most interesting projects I've done - and it's proven by the fact that I have no proper documentation of it. When I took photos of the food I ate, it didn't only contain information about ingredients. Those images contained all different sorts of information such as brands, location/background, and time/brightness. Also, I wasn't quite clear what can be "meal" to me, while I'm the type of person who eats heavy snacks quite often. The project taught me that solid rules and restrictions of collecting data, will give more regular and simpler outcome - which is easier to pull pattern out of it. For example, if I only collected the geographical sources of ingredients - it might have created a much meaningful project. On another hand, the action of collecting data will be harder, because not all types of food have clear origins of ingredients (or there can be "unknown" category). Sometimes, that's not what people always want from archiving and documentation. Archive without rules is exciting as well, and I love all my meaningless photos and Instagram posts. The part that majority of people feel creepy about is that even from those meaningless photo uploads and clicks, companies are still available to quantify something from you. Maybe every component about myself can be quantified, and I just don't have enough tools to do so. As I've mentioned in my previous project, my goal for the next self-tracking is being less arbitrary as much as possible, while keeping interesting topic to track. Ultimately, I hope I learn something unknown about myself through this tracking.